SEPCO SolarDDL Dusk-to-Dawn LED pole- or wall-mounted LED lighting units provide crisp white, ultra long-lasting light precisely where needed, at motorist and pedestrian levels. The LED is solar powered at all times, with a minimum of five night’s reserve and is 100% off grid, automatically self-storing, and self-recharging. Product Design: SEPCO Solar Electric Power Company In-House product development and engineering team in partnership with Hubbell Lighting. Manufacturer: SEPCO, founded 1994. A U.S. family-owned entrepreneurial manufacturer of solar lighting luminaires exclusively, and solar-power systems for off grid outdoor lighting. 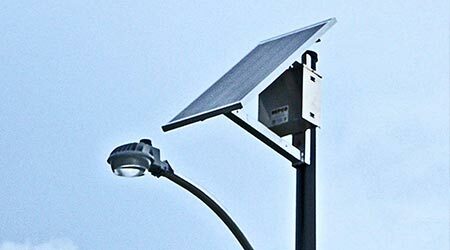 Product Applications: SEPCO SolarDDL units are versatile, dusk-to-dawn LED luminaires that provide general purpose, security, and landscape lighting in area’s typically cost-prohibitive for electrical power feeds. SEPCO SolarDDL LED delivers optical performance that matches commercial grid lighting — in a stand-alone solar system. SEPCO SolarDDL LED solar-power assemblies are integral to light and pole designs, sized to customer requirements, location and site conditions. Product Description: SEPCO SolarDDL LED has a low-scale architecturally rounded lighthead that distributes direct-downward, high color-rendition white light ideal for general area, security; pedestrian walkway, roadway and landscape lighting applications. Compact solar-panel assemblies for SolarDDL LED are designed and programed by SEPCO in-house solar-lighting engineers to automatically recharge their concealed storage-battery assemblies. Construction and Finishes: SEPCO SolarDDL LED housings and doors are precision-tooled, rugged die-cast aluminum. Textured gray polyester powder-coat finishes are standard throughout. Nine high-power LEDs produce 28 watts, delivering 3388 lumens with the typical symmetrical lens; 3246 lumens with an asymmetrical lens, with 5000K CCT, and a CRI of 67. SEPCO SolarDDL LED units can be mounted anywhere on the pole or wall below the solar panel; or can be mounted separately on another pole or wall. Each model and wattage saves 100% of grid-based electrical energy; lowers maintenance costs; lasts decades; makes grid brownouts or failures distant memories. SEPCO SolarDDL LED light-pole options are available in accordance with power-assembly size, wind-load requirements, above- or in-ground bases. Pole choices include: aluminum, composite fiberglass or galvanized steel. Individual LED dimming drivers are sealed to IP66 or IP67 standards. All units are made in the USA at SEPCO’s own modern plant.